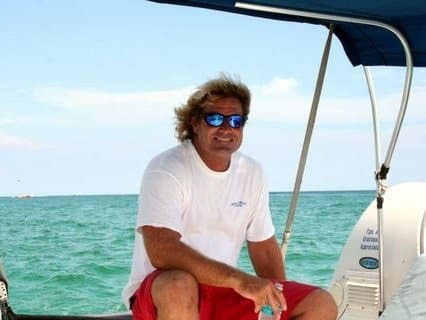 I’ve been fishing and sailing these waters for over 30 years, and nothing would please me more then to help you and your family make the memory of a lifetime. Come ‘Sail Away’ with me. I will ensure you the time of your life! “Sail Away is a locally owned and operated business that charters a thirty foot long catamaran for private party excursions that sail the flat water on the Choctawhatchee Bay or open water out on the gorgeous Gulf. Captain Bryan Klein, with over fifteen year’s experience, sun bleached blonde hair, rugged good looks and a broad smile is the kind of guy you would want to go with. He grew up here in Destin on the bay which obviously led to a passion for his maritime sailing enterprise. Bryan got his captain’s license when he was twenty-seven years old and purchased his beloved catamaran nine years ago. The friendly laid back sailboat captain has been operating this business ever since, much to the delight of many visiting adventurers. This thirty foot, double hulled sail boat can take up to six guests at a time for a flat rate of $120 per hour which is extremely reasonable. If you have a full party and divide it up among all six participants it comes to about $20.00 per person for each hour. These private cruises usually range from two to eight hours and are customized for whatever your group wants to do or for wherever you want to go. Some choose to sail the beautiful waters of the Choctawhatchee Bay, while others prefer the adventure of the open sea. Captain Klein can take guests sailing as far as five miles out into the gulf. As far as a fun itinerary is concerned, the choice is totally yours. You, your family and friends can decide what kind of excursion is most appealing. Many like to do free sailing, covering as much water as possible as you explore this part of paradise. Dolphin watching is a popular pursuit since Captain Klein can keep up with the pods that frolic and feed here. In fact, many times he is able to get the boat within arm’s reach of the playful dolphin. Snorkelingis another favorite past time and he has several locations to choose from including the rocky jetties near East Pass as well as the Gulf Island National Seashore. Some like to collect shells in the shallow water or sand dollars out in the Gulf. Masks, snorkels, fins, nets and buckets are all provided at no extra cost. The anglers among you may enjoy doing some light tackle trolling which is done on a catch and release basis. Bryan is even willing to share some introductory lessons on sailing and has let special guests navigate the boat. Another sailing cruise that has become quite popular, ranking right up there with dolphin watching and snorkeling are his sunset cruises. During the Summer months, the sun moves north and sets right over the western waters of Choctawhatchee Bay. The visual effect is ethereal and awesomely beautiful. You will feel like you are sailing in paradise, with just the sound of the wind and a radiant, multicolored sky ahead of you that looks like Heaven. It can inspire romance and at least one guest took advantage of this setting when he chartered the catamaran with his girl friend, using this setting to ask her to marry him. You are allowed to bring food and beverages on board and presumably in this case, I’m sure he brought champagne! Captain Klein always supplies two big coolers of ice for all beverages. Others have celebrated special Hallmark Anniversary excursions that have rekindled romance and provided unique golden memories that last a lifetime. Captain Klein says his guests range from children to seniors but for the most part it’s usually a family group of all ages. Groups of friends have often chartered Bryan’s catamaran as well and some of them have him take them by boat to party at Crab Island near the Destin bridge. 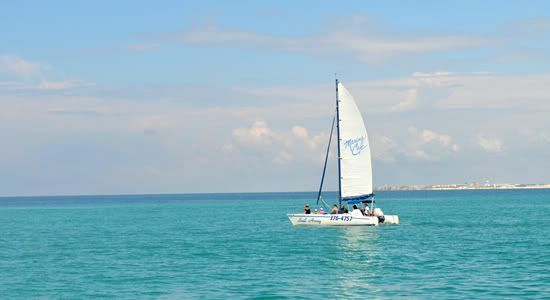 Sail Away Destin runs daily throughout the season from 9am to almost 9pm. The season runs from March 1st through November 15th seven days a week. Sailing Charters are available at other times of the year on a reservation basis for those brave enough to go out during the chilly months. During the regular season, depending upon the length of bookings, there are usually three trips a day. One is in the morning, another around noon and the last one late in the day around sunset. As was mentioned before, you can charter the sailboat for up to eight hours but most people go out for about three hours. 2019 © Sail Away Destin Florida.